Two Pieces of English Sterling Silver Tableware, London, a small William IV fish trowel, 1836-37, William Theobalds, maker, with the handle cast with three putti, lg. 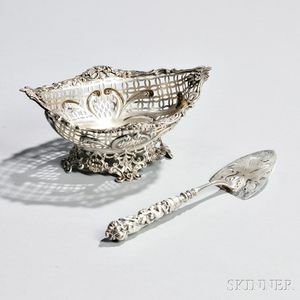 8 1/8; and a Victorian sweetmeat basket, 1889-90, William Comyns, maker, ht. 3 1/2 in., approx. 7.7 troy oz.